Coming through with Flying Colors - the prog geezers' stick together tour "Live In Europe" captured in Tilburg, Holland on September 20, 2012. Mike Portnoy (Dream Theater), Neal Morse (Spock's Beard), Dave LaRue (Dixie Dregs), Steve Morse (Deep Purple, Dixie Dregs), and Casey McPherson (Alpha Rev, Endochine). It's hardly strickly prog-rock material though? All genres blend together and the styles goes across the board from pop to rock and post-grunge to prog. I've been watching this DVD several times and it's a very intense show with tons of great melodies and excellent musicianship. To be frank, the DVD is friggin' awesome from the moment you push play 'til it's over. The varied vocal parts and harmonies by the three (McPherson, Morse, Portnoy) something out of the ordinary and LaRue is no doubt a new fave bass player. Merely new to this particular reviewer though since I'm not really too familiar with Dixie Dregs' material (know the rest of the bands by heart). Great stage persona even if Morse is more the U.K. TV detective than wild rock musician on stage. The originals: But as they begin the show with, "Blue Ocean", you'll quickly notice they're actually playing soft-rock in the vein of Steely Dan and TOTO. "Shoulda Coulda Woulda", post grunge rock with aggressive Pearl Jam-ish vocals and structure. "Love Is What I'm Waiting For" quite a lot in common with Supertramp and John Lennon. "The Storm", lovely pop rock with the magical refrain and hook. "Better Than Walking Away", bits and piece of Peter Gabriel and Kate Bush's duet 'Don't Give Up'. "Kayla", the return to soft rock and Steely Dan? "All Falls Down" - Morse ripping it up on guitar and check out the warm rich tone and the classical scale - top notch and very Malmsteen-ish. "Everything Changes", Pink Floyd melancholia mixed with modern pop rock and "Infinite Fire" always remind me of World Trade (the band feat. Billy Sherwood -pomp rock -Yes). The covers: Are we fed up with Hallelujah? I believe we hit rock bottom when Jon Bon Jovi decided to cover it too and here's yet another version. From now on it's only Leonard Cohen's original and the green ogre/troll of 'Shrek' that are allowed to be considered as acceptable versions. Damn the rest of you - damn you all. Casey is one helluva fine vocalist though and I'd rather listen to another song from the Endochine days. I'm counting (7) covers among the 18 tracks and some of them are more interesting than others. They've merely cut one studio album together so I guess they needed the extra material in the vein of songs from their previous acts. Odyssey (Dixie Dregs), Repentance (Dream Theater), and June (Spock's Beard) are all impressive stuff where the latter gets the laidback treatment. They finish off the show and their audience with a storming version of Deep Purple's "Space Truckin" where Neal Morse tries his very best to be Ian 'Air-Siren' Gillan. The documentary: Bonus content is the 45 minute long behind the scene doc. Fragments and fun stuff from the rehearsals prior to their very first tour. The pre-show met and greet with fans (dude, can you sign this? ), dressing-room warm up and banter, the Spinal Tap moment before entering the stage (where's the stage?) and various short interviews with all the band members. For instance, a very humble Steve Morse talks about the greatness of his fellow band mates (good on ya' mate). Mike Portnoy speaks about his favourite part of the show, Casey's solo spot, when the audience can really connect and get to know him (Casey), since it's his first time playing Europe. Casey on the other hand talks about brotherhood and the whole 'the closer you are together - the better you play'. They've merely been communicating via emails prior to heading out on the road(s). Final verdict: Very impressive stuff and the total playtime of 155 minutes goes by just like that. Like what... like that. 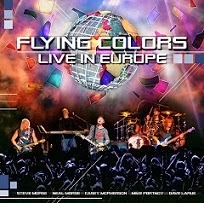 Highly recommended and there's frankly no need to be the massive prog-rock fan to enjoy Flying Colors. Release date October 16 on DVD, blu-ray, dubbel-cd, tripple vinyl, and digital d/l.